is a Jew?" vote. The bills were defeated. AP/Wide World Photo. "AIDS in the Work Place." in our history," said Mazer. would be in this field,"
Kelly Assisted Living in Ft.
both very happy here, he said. Shayna Chazin, Susan Schimmel, Shawron Weingarten. as well as counseled clients. by the onset of AIDS illness. students here and in Israel. are given "from time to time"
school because of AIDS illness. be better than last year. and Susan with six-year olds. "I think it went very well,"
installed at all the facilities. "And our staff is fantastic,"
vary on what that may imply. diviner, a sorcerer ..." (Deut. 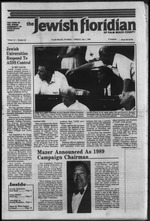 Combined Jewish Appeal Jewish Federation of Palm Beach County. Inc.
Officers President. Alec Engelstein; Vi-c Presidents. Barry S Berg, Arnold L. Lamport. Gilbert S.
as the gift of astrology. extend to the People of Israel. not on merit but on the stars." to be called a science. Senate bill to move the TJ.S! wanly to the future and bemoan the encroachments of age. Center is now in operation. not able to get to the JCC. required for each one-way trip. quality of life for yourself. 13, 20 and 27 at 1:30 to 3:30. Fee: $2 for complete series. p.m. at JCC. Fee: $1. with open discussions. No fee. Verbelen worked for the U.S.
ators of the Nazi Party and SS. July 13, and join us for a unique dining experience. Ann at the JCC, 689-7700. Happy Hour. Hostess: Cynthia 471-9647.
call Ann at the JCC, 689-7700. Sunday, July 12,12 noon. Meet at Shooters (Federal Hwy. the pool. Bring your swimsuit and towel and join the crowd. For more information call Cynthia, 471-9647. JCC members $5 per person; non-members $6 per person. parents can help their children work through conflicts. the first Jew to hold that post. Reagan's new chief of staff. dedicated young man serving his country." Palm Beach, moved here 15 years ago from Brooklyn, N.Y.
"but we're also proud that we're Jews." just don't say no. They're too good to be true." Dr.
of the board of directors for the symphony and the opera. 1985. He now is director emeritus for the opera. Coleman, the opera's director of development. in Charlotte, N.C. and five grandchildren. 33409. Or call the JCC YOUTH HOTLINE 689-7703.
to his private law practice. percent of whom are Catholic. Hadassah at Purim in 1912.
the Jewish Data Bank, and Dr.
cator of where you stand." grenades could have caused serious casualties. responsibility. The police are investigating. fire to prayer books and Torah scrolls. They left no clues behind. computer to the new system. "I was involved up north,"
vision talk show in Baltimore.
] I'd like to call? * kjs or after 11 p.m. and save even more. Rabbi Randall J. Konigsburg holies and Addicts. Region of United Synagogue Youth. the treatment of Alzheimer's Disease. patients at early to moderate stages of the Disease. but is not yet available to patients in the United States. J. Rackoff. Sabbath services, Friday 8 p.m., Saturday 10 a.m.
fcJlglta^ftBdJiolidays 9 a.m., Monday through Friday ? a.m.
Richard D. Messing. Phone 1-569-4700. I attended I simply did not exist. Glazed Donuts. 12 for $1"
Prices effective Thurs.. June SO thru Wed.. July 6. 1968. Quantity Rights reserved. Only in Dade. that there are a few "friendly"
as well as some "opportunity"
the most" in influencing U.S.
snap one moment like that,"
sand of the Sinai Desert. Arabia, according to a leading Israeli expert. with chemical or nuclear weapons." cend political party and political ideology. Present, from left, were: Morris Abram. tive director of the Presidents Conference. July 1 7:58 p. m.
July 8 7:58 p. m.
and Arlynne War shall, executive vice president. Funeral in Pine Lawn, N.Y.
Phillip, 83, of West Palm Beach. Boca Raton. Funeral in Boston. Ohio and Mr. and Mrs.
TOT MLN KAOi MM MraorM HA Id KKIUUIDUDAU 21IM W. Grtflta Id. Ofn Imwrd Co tm-tnr Mmonh pre-nttd arm* parchem and iw rrtrannt 10 an pmtota pmHtfmdma. and deposits now being accepted. Final payment due Aug.
for over 200 human care agencies serviced by RSVP. Channel 5, with host Barbara Godron. Re-runs. When you donate clolhes. furniture, household items or even eslales. Help beep our heritage alive, make Your donalion TODAY!